The players were in a bad spot after last week's game. Their thieves were on the front line, their fighters were pinned by humanoids, and reinforcements were coming up the stairs. The good news was that the players used all those detailed pictures to plan during the week! I saw plenty of chatter over email, involving looking through the backlog of scrolls, unused spells, and even consulting the rules (on AD&D Fighting Withdrawals) to figure out how to turn the situation around. They came to game night loaded with ideas. The bad news is those reinforcements they heard showed up almost immediately, in the form of 5 nasty trolls followed by a giant troll. Back when we played minis-heavy D&D, I'd used blocks of wood if I didn't have enough miniatures, so we've got a couple of trolls represented by wood blocks in there. The party won a miraculous initiative, beating the trolls with enough segments that Forlorn and Konstantine were able to layer a couple of fireballs on the left side of the battle before those trolls were able to attack after closing. I've got to give my players credit, they are committed to taking dice out of the DM's hand by layering damage and ensuring kills, rather than spreading the damage around. They'd rather overkill than leave a 1 hit point monster. After a handful of bad saving throws by me, at least 3 of the trolls were eliminated, and the giant troll on the stairs was in bad shape (and then dropped by a flurry of magic missiles). Meanwhile, the clerics were freed up enough to start using Hold Person to drop norkers, and Mister Moore went Invisible (getting the spell off before being attacked) and he was able to escape from the back corner. As an unarmored person with 120' movement, he's able to move 24 squares when using a battle grid, and that was enough for him to skirt the entire melee and get back behind friendly lines. The AD&D combat movement rates are silly. In the next phase of the battle, the group started to execute fighting withdrawals to get the thieves back to safety, and Leonidas and Kobra formed a front line with Mordecai (they're a little hard to see past the trolls). 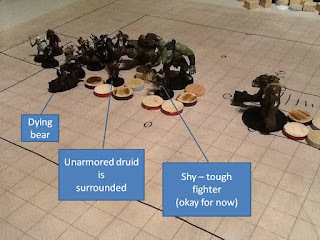 The AD&D Fighting Withdrawal is interesting, because the monsters get to follow for free, if able - the fighters never broke contact, parrying the whole time, but still able to reshape the battle field. Monster reinforcements kept coming up the stairs, and the clerics had been working on a solution - while Mordecai was holding the line, Donavich rummaged through the scrolls and found the scroll with Blade Barrier. Unfortunately, there was an obstacle separating the sets of stairs, so the Blade Barrier only blocked the right stairs, but at least one big creature ran into it and got chopped to mince meat before the rest of them decided to forebear. Meanwhile, Mister Moore used Slow on the surviving trolls and norkers, giving the front line fighters much-needed breathing room - we used pennies to indicate monsters that were slowed. Then he switched to tossing fireballs with the wand of fireballs towards the open stair case where reinforcements were coming. Multiple waves of foot soldiers ended up incinerated. As monsters realized the right-hand stairs were blocked by the whirling blades of death, they started to jam the left-hand stairs, with some reinforcements coming out every round or so. One group managed to clear the stairs area before getting incinerated by Mister Moore's fireballs, and they charged Shy, Boris, and the bear. Boris's heroic brown bear was finally dropped by a norker, after soaking a lot of troll damage earlier in the evening. Boris prepared a Cure Light Wounds to heal it, but was clubbed by a norker and the spell was ruined. The trolls are only attacking every other round due to Slow, and one of them is down while it regenerates - the party is scrambling to burn it quickly. Right near the end of the night, an ogre appeared at the top of the stairs, leading another troop of norkers. However, the party has formed a solid front line of fighters, with clerics performing a bit of spot healing, and Mister Moore is blasting with the wand of fireballs. It no longer looks like a TPK is about to happen, but Boris, Shy and the Bear all need help. The arcane casters have exhausted all of their attack spells, except for the wand of fireballs and whatever they have on their scrolls, but there is a fair amount of healing and clerical magic left. The gigantic battle at the beginning of THE FORGOTTEN TEMPLE OF THARIZDUN will continue next game session. I love the pictures, by the way. And the wood block minis. Oh man, not the bear! Why can't someone make a D&D movie about this? Great post and pics! I'm with Scottsz, forget those other D&D movies, someone needed to make a film of Against the Giants, or Vault of the Drow, the Lost Caverns, or the assault on Tharizdun. @Jack: the other players were like, 'Yeah, we can just find another bear'. The druid doesn't see it that way, he likes this one. I want to go the movies!